Sunday’s classes were quite interesting. The first session was directed by Noguchi Daishihan, and we covered some techniques from the Jin Ryaku no Maki of the tenchijin. As always his interpretation was mindblowing. Nothing new but a fresh understanding. These techniques that I have been learning with him for more than twenty years, and that I’m teaching regularly in my dôjô, seem to contain some new hidden secrets each time I have the chance to train them in Japan. As you know I am a “tenchijin freak” and these techniques are always full of insights. To me these Jin Ryaku techniques are exactly like the Kihon happô or the sanshin no kata of the Ten Ryaku. Then it was time for sensei’s class. After drying the sweat and putting up a new t-shirt, he arrived. Sensei asked my friend José to begin the class. José did a technique against double Tsuki ending in a Musōdori/Ô gyaku. Sensei reproduced it by insisting on the “no grabbing” and the importance of using the tip of the elbow to lock the shoulder blade. “by using the elbow in this way”, he said, “you can do it even if you have a weapon in your hand”. He made a variation with the ninjatō applying some similar control. Once again he insisted on the importance of not waving or twirling the sword uselessly, but on the contrary to let the sword be positioned by the natural movements of 躯, Karada, the body. I must be honest, it was easy to understand and watch but nearly impossible to do. I guess I need another ten years to reach that level. We also did some Bō, and still with the same feeling. The calligraphy session was welcomed as we could dry a little. Tanaka San had brought me a nice scroll and sensei used it to draw a 達磨 (Daruma). 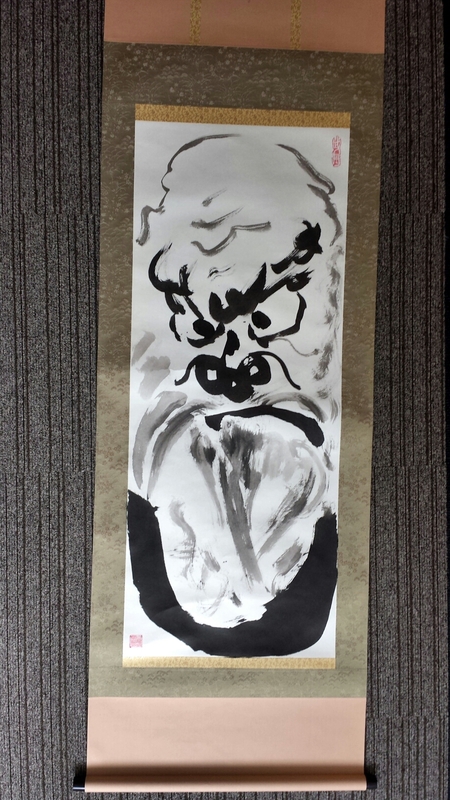 Usually I get calligraphies but yesterday he drew a “mean” Daruma for me. Having witnessed him draw those daruma for years and even though I’m not an art critic, I can tell that each time he draws it differently. In fact it is like a Waza, he will give a new interpretation to it, each time he is painting it. It made me think a lot and I tried to connect the dots. We all know the story (legend, myth) of 達磨, Daruma (aka boddhidharma), this kalaripayat monk and healer, who brought martial arts to the Shaolin monks from South India. The legend says that he meditated so long that his arms and legs fell from his body, leaving only the head and the trunk. 躯, Karada means body, but if you break the sound down into 幹, kara and 達, da, you get 幹達, or “to get an accomplished trunk”. And this is exactly what sensei has been teaching this year. We have to let our body do the technique without trying to hold or use any force, to reach (da) victory. Once again it is echoing the theme of the year of Shingin Budō. But there is more. If you break down the sound “daruma” and replace it with 達琉真, daruma, you get “to reach, accomplish the pure gem”. This is what the bujinkan is teaching. The bujinkan of Hatsumi sensei is not about mere techniques but it is inspired or guided by the divine so that we can shine naturally like pure jewels. Our mind forces us to grab with the hands and use strength when, in fact, if we stay connected, Nature does it alone. We are connected permanently to Nature so we should do nothing that could sever this connection “en no Kirinai”. Stop thinking, stop grabbing. Be connected! Next Post A Waza Is A Sketch!